Sydney Harbour is set to celebrate every weekend, with Saturday fireworks at Darling Harbour now back due to popular demand. At 9pm each Saturday night the fireworks will light up the sky, adding further beauty and a stunning visual display to the perennially popular harbourside destination. The move comes as Darling Harbour enjoys a transformation, courtesy of a major redevelopment that is now nearing completion. So, let’s explore all the news and action Darling Harbour as the historic precinct enters a new era. 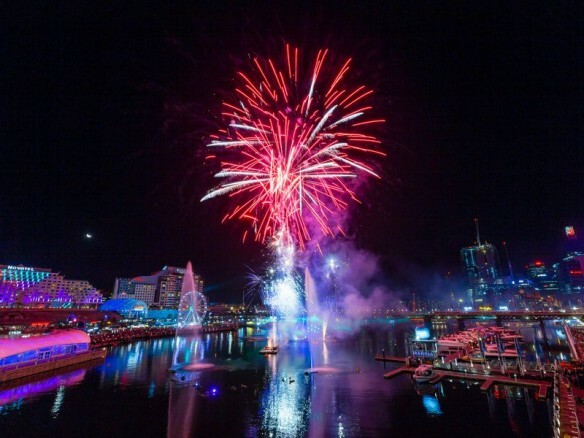 After an 18-month hiatus, weekly fireworks are back on the agenda, kicking off at Darling Harbour each and every Saturday night. Set down as a regular fixture from now until mid-next year, the spectacular display commences at 9pm during daylight savings time, and 8.30pm from April 13. Organisers note Cockle Bay is the ideal destination to enjoy the weekly festivities, with the fireworks offering the perfect accompaniment to dinner or events at one of Sydney’s most glorious waterfront locations. The fireworks join a lengthy list of regular fixtures all adding to the excitement of the harbourside destination. The Star of the Show Ferris Wheel is also in residence until February 29, offering a simply stunning 360 degree view of the harbour from a height of 32m. Meanwhile, the precinct is enjoying a major revamp. Touted as the “biggest renovation in the precinct’s history”, Darling Harbour has been receiving a facelift over recent years. Tumbalong Park was the first new fixture to open, offering an expansive parkland akin to Sydney’s very own public backyard. The International Convention Centre received a state-of-the-art overhaul and now public access areas, walkways and open spaces have offered the precinct a new lease on life. In the meantime, a new site for the IMAX is under construction as the Ribbon Project takes shape. Once complete, the development will offer a 25-storey hotel and serviced apartment development that will provide a modern setting for the IMAX Theatre, plus retail and entertainment spaces. The entire Darling Harbour precinct is also becoming more connected with the city, courtesy of the Darling Square project which features one of the city’s largest public squares with a wide pedestrian corridor that connects Central Station to Darling Harbour’s waterfront. Darling Harbour might be changing, but popular offerings such as George’s Mediterranean Bar and Grill remain a constant, providing Darling Harbour diners with a premier eatery overlooking all the action. Whether it’s dinner, drinks and Saturday night fireworks, an after-work beverage at our weekday happy hour, or a weekend brunch with the family overlooking the water, our restaurant offers a front row seat to enjoy all the Darling Harbour action.